A Bride On A Budget received these canvas prints for review. All additional materials were purchased by ABOAB. All thoughts and opinions belong to ABOAB. 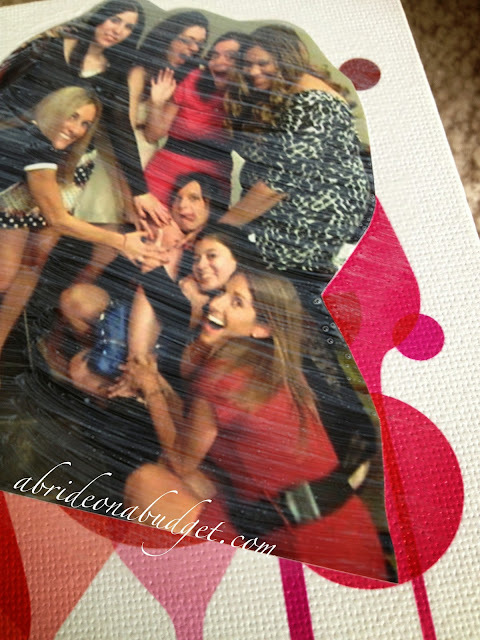 This is a fictional bachelorette party. None of the people photographed were in Savannah on March 7 to 9 for this party. Any similarities are pure coincidence. 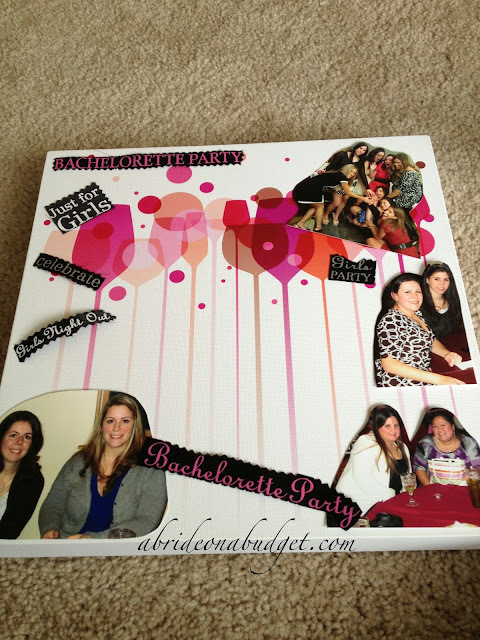 I'm not crazy about traditional guest books. For one thing, they remind me of the sign in books at funerals. Plus, you can't add too much personality to them. Your guests could draw photos where they sign their names, but that's about it. Then, when your party is over, you take the book and leave it on a shelf to collect dust. You don't display it and enjoy it. You also can't decorate it and make it your own. If you want something to display, think about Canvas Kudos, a company we got to check out. Canvas Kudos has a ton of canvas prints to choose from. Of course, there are wedding prints, but you can even find ones for birthdays, new babies, graduations, and more. Any occasion you can think of, you can find a print for. I was looking at Canvas Kudos and fell in love with two of the prints: floating flutes and wedding bike. Each of the canvas prints arrives with a permanent ink marker and hardware to hang the canvas when you're done. The concept is simple. Display this at your party with a marker, have your guests sign. Easy. And don't worry, that "Write on me!" text isn't actually on your board. It's on the plastic wrapping that covers the board. The plastic is a great way to ensure that your board won't get dirty before your event. I didn't want to just leave the canvas plain, though, so I rounded up a few arts and crafts supplies. 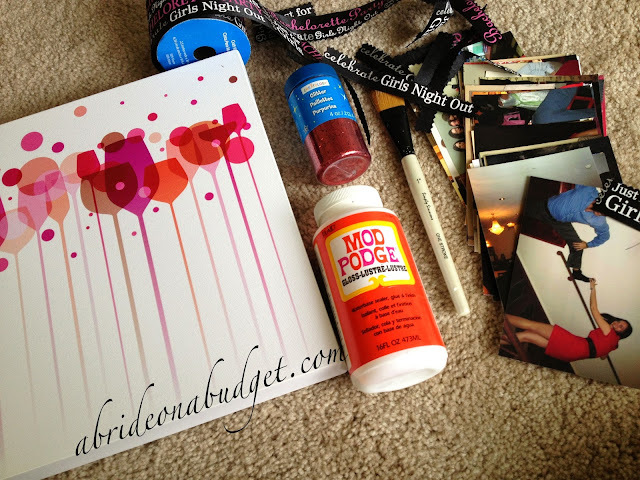 I grabbed stuff that I already had around the house: bachelorette party ribbon that was gifted to me, a paint brush, glitter, Mod Podge, and photos. You probably have all this stuff in your craft drawer at home. I made sure to arrange everything the way I wanted it. And then I used Mod Podge to hold it all down. That stuff is amazing, by the way. 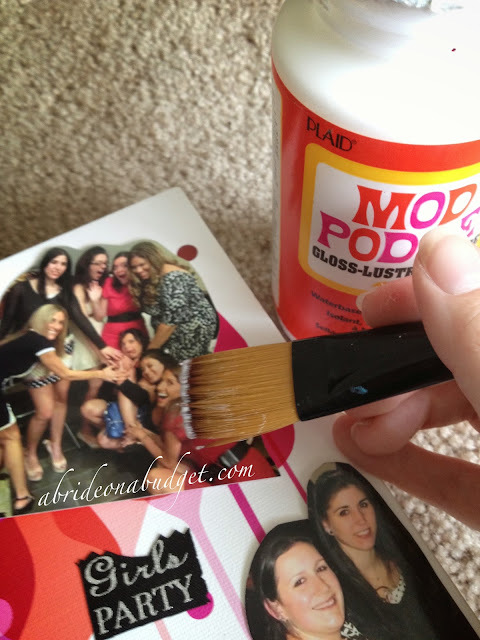 Use it as glue on the back of your photos and ribbon, and then coat them on top as well. Like, completely on top. But don't worry. It dries clear. It's just a way to seal down your photos and make sure they don't pop up at the corners. Now, I would say be as careful as possible with it and try not to cover the entire board in Mod Podge, but it's okay. You can write on top of it with a permanent ink marker with ease. I was planning on adding glitter to it but it started to get a little busy for me so I left it off. After it's decorated, have your guests sign on the board with permanent ink markers. What's great about technology is you can actually take photos at something like a bachelorette party, upload them from your phone to a drugstore, then pick them up less than an hour later. 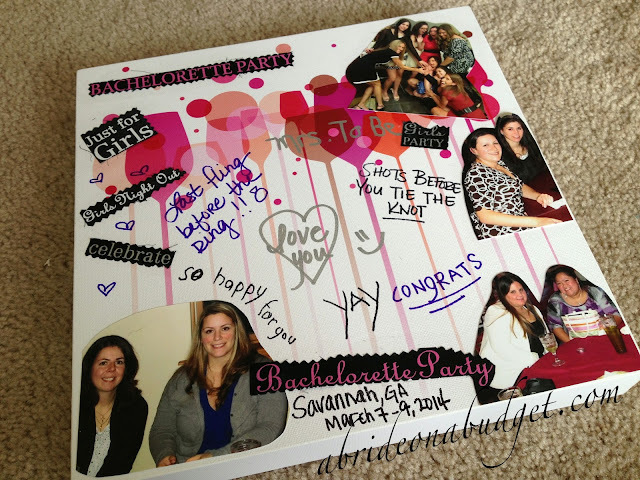 You can create your canvas and have it ready for your guests to sign (maybe on day two of the bachelorette party). If you do that, you can save room for photos of the rest of the weekend. 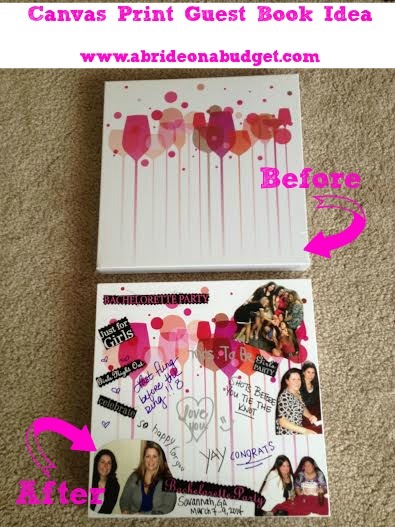 If you're using this for a wedding, you could either use photos of you and your groom from the past (or your engagement photos), or you can ask your guests to sign in the center and you can decorate it with wedding photos later. 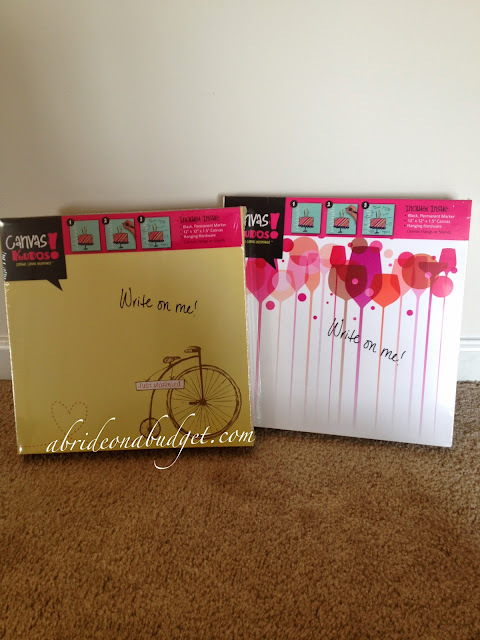 BRIDAL BABBLE: Which canvas print guest book would you choose? I like the Birthday Balloons canvas. I like the "wedding bike" canvas! I like the Get Well Soon-Sunflowers. Much nicer than giving a card. I love the Damask or the Floating Flutes that you got! I love the family tree! I would get the Cherish one.